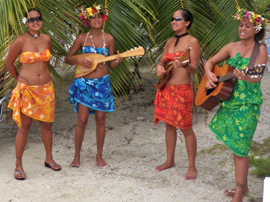 French Polynesia is a place to take it slow and experience relaxed island culture. Just hearing the word ‘Tahiti’ conjures beautiful images: a humid breeze over a turquoise sea, hibiscus flowers, dancers in grass skirts. The islands of French Polynesia are known as heaven on earth and is about as dreamy as reality gets. This itinerary gives you the opportunity to visit 8 of the islands of French Polynesia where you can explore or relax to your heart’s content. Imagine sailing through the islands of French Polynesia with Amazing Journeys. We have selected Oceania Cruises Marina, providing luxury and elegance while making you feel at home with comfort and style. Relax onboard and savor exquisite cuisine that not only is renowned as the finest at sea, but also rivals the best restaurants ashore. Inspired by Master Chef Jacques Pepin, these culinary delights have always been a hallmark that distinguishes the Oceania Cruises experience from any other. Lavish complimentary amenities abound, and there are never supplemental charges in any of the onboard restaurants. The ambiance is “country club casual” and you won’t have to worry about packing your formal clothes. Add to this our celebrated Amazing Journeys touches such as onboard events and parties, a lively group of Jewish Singles from around the globe, group shore excursions, group dining and all fully escorted by one of our Amazing Journeys team members. 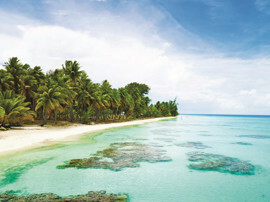 Are you ready to treat yourself to luxury and French Polynesia? C’mon along! We’d love to have you! And to make your vacation as hassle-free as possible, we have bundled everything together, so the price you see is the price you pay. The rates on our Pricing tab include all taxes, gratuities and fees (valued at $883), 3 complimentary shore excursions, free Internet, a $100 onboard credit (per stateroom), and much more. With all of these additions, our cruise is virtually all-inclusive! Click here to see a preview video of the French Polynesia Cruise! 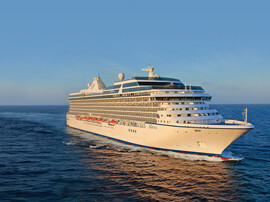 Embark Oceania Marina, embark at 1 pm – Our cruise and your Amazing Journey begins today. Get to know your fellow traveling companions as we gather poolside for a sailaway celebration, followed by our Welcome Aboard program and group ice breaker. A group dinner onboard the beautiful Oceania Marina will follow. 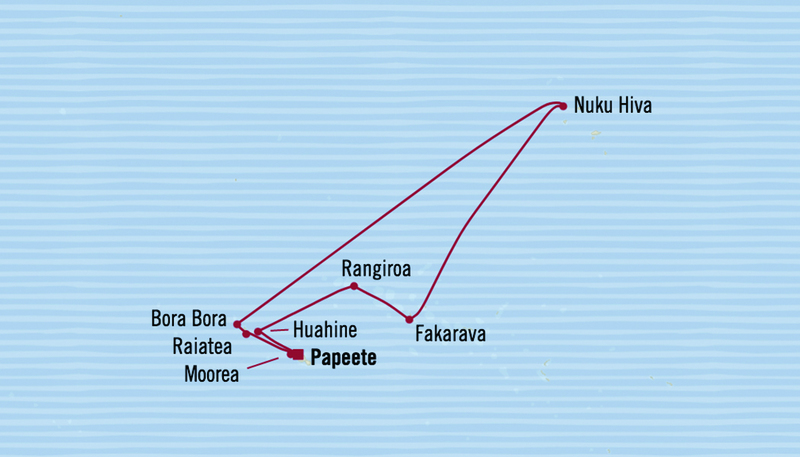 Papeete: depart at 5 am, Moorea: arrive at 8 am, depart at 5pm – After setting sail from Papeete, breathtakingly beautiful, stunning landscapes await us in Moorea. From the verdant mountains to the azure seas and white sand beaches, your journey through French Polynesia will start off on the right foot. Take a canoe ride through the lagoon, snorkel the reefs or hike up to the Afareaitu Waterfalls. Tonight, we’ll come together for an Amazing Journeys cocktail party, followed by late night dancing. Arrive at 8 am, depart at 11 pm – You’ll notice the rich scent of vanilla the moment you step off the ship onto this stunning island with its vanilla plantations scattered throughout. Visit a pearl farm, snorkel the clear waters of the surrounding reef or take a kayak trip along the Faaroa River. Arrive at 8 am – The dramatic Mount Otemanu stands watch over the sparkling turquoise waters and sugary sands of Bora Bora, one of the most quintessential island in the world. Snorkel, swim with the manta rays or enjoy an outrigger canoe ride through the lagoon and its lovely coral islands. Depart at 1 pm – Spend your morning taking in all that Bora Bora has to offer. Hop on an off-road adventure through the island, board a glass bottom boat to see the amazing sea life or take a jet ski around the island. This evening, join with your friends onboard to recap your favorite part of the island as we toast French Polynesia with a sunset cocktail on deck. Cruising – Our day at sea will provide lots of opportunities for group fun. Enjoy a massage at the spa, participate in wine tasting or yoga – the day is yours to recharge. Later, join us for “Jacuzz-a-Palooza” with your new friends. Tonight, join together with others from our group for a Kabbalat Shabbat service at sea. Arrive at 12 pm – Visit the entrancing Vaipo Waterfalls and Cascade Tevaipo, which is one of the world’s tallest falls at over 1,100 feet. Wander the black sand beaches, marvel at the giant tiki at Piki Vehini or get adventurous on an all-terrain vehicle excursion around the craggy island. Depart at 6 pm – Drive to the Taipivai Valley, one of the richest archeological sites in the Marquesas Islands. The Taipivai Valley was made famous by the American writer and former sailor, Herman Melville, who deserted his ship and hid in this valley. Captured by the indigenous natives, he lived in the Taipivai Valley for three weeks and used his experience as the inspiration for his novel, Typee. Cruising – Our day at sea will provide lots of opportunities for great times on our floating resort. Spend the day relaxing poolside with your friends, enjoy a massage at the spa, participate in pilates – choose to do it all, or nothing at all. It’s your vacation, and we want you to enjoy every minute of it! Arrive at 8 am, depart at 5 pm – Pure, pristine and dreamlike, the ecosystem of this gorgeous island is home to extremely rare birds, plants and crustaceans. Quaint villages, old coral churches and welcoming people are intertwined with a spectacular lagoon creating a paradise like none other in the world. Arrive at 8 am, depart at 5 pm – Stunning, beautiful, this South Pacific atoll is a “natural aquarium,” its lagoon filled with colorful undersea life. Visit the pearl farms, dive with manta rays, explore the atoll’s unique winery or just choose a calming respite on a pink sand beach. Arrive at 8 am, depart at 6 pm – “The Garden Island” is filled with easily accessible pristine white beaches kissed by emerald waters. Ride a bicycle and explore the island, take a boat to the hanging oyster beds to see the black pearl farm or go on a shark-feeding excursion. Tonight, join together with others from our group for our Amazing Journeys Farewell. Arrive at 5 am – Our cruise ends here. You’ll take home memories of your experience in French Polynesia, plus friendships to last a lifetime. A deposit of $850 is due with your reservation. Final payment is due on November 1, 2018. Cabins are assigned at time of registration. Those who sign up first receive priority cabin location. This ship is made up of mostly veranda staterooms and interior cabins are extremely limited. If you need nights at the hotel before or after the cruise, click here for details on our Tahiti Pre-Cruise or ask us about availability for rooms after the cruise. Cancellation Policy for Cruise and Pre-Cruise Packages: From the time of deposit until September 4, 2018, there is a $100 penalty for cancellation. From September 5 – November 1, 2018, the cancellation penalty is the amount of the deposit for the cruise and pre-cruise package. From November 2 – 20, 2018, the cancellation penalty is 25% of the total for the cruise and pre-cruise package. From November 21 – December 10, 2018, the cancellation penalty is 50% of the total for the cruise and pre-cruise package. From December 11, 2018 – January 8, 2019, the cancellation penalty is 75% of the total for the cruise and pre-cruise package. Cancellations made on January 9, 2019 or after and “no-shows” will receive no refund. There is no refund in the event of interruption or cancellation after the start of the cruise and pre-cruise. Oceania Air Cancellation Penalties: For those using Oceania Cruises Air Package, the following cancellation penalties apply: Once ticketed (approximately 60 days prior to departure), airfare is subject to cancellation penalty of 100%. Custom air fee once accepted is subject to cancellation penalty of 100% of fee. Air supplemental fee within 60 days is subject to penalty of 100% of fee. Proof of Citizenship: All passengers must present a valid passport (valid for six months beyond the last date of travel) to board the vessel. For those who are citizens of the US, Canada and Australia, a visa is not required at this time to visit French Polynesia. For those citizens of the UK and other countries, please consult the French Embassy to verify visa requirements. Dining Preference: The Grand Dining Room, The Bistro, Polo Grill, Toscana, Jacques, Red Ginger and Terrace Café and are some of the restaurants and specialty restaurants offered without a surcharge onboard. Some require reservations and others do not. As a group, we will be offering a variety of restaurants throughout the sailing. 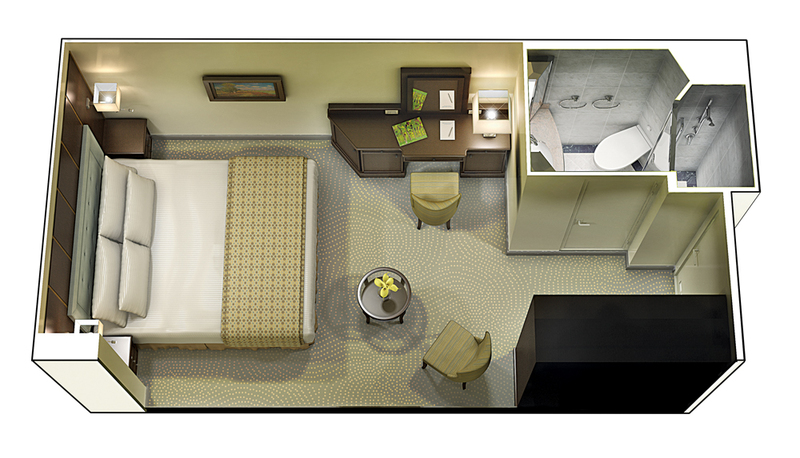 Complimentary 24 hour room service is also available. Kosher meals are available – please contact Amazing Journeys at least 90 days in advance of your sailing so that we may provide your preferred selections. Port Taxes, Fuel Surcharges, Government Fees and Gratuities: Port taxes, government fees and gratuities have been included in the rate. Port taxes, government fees and gratuities are subject to change. Should oil costs go above $65 per barrel and the cruise line adds fuel surcharges, Amazing Journeys reserves the right to add them to the cost of the cruise. The cost will be no more than $10 per guest/per day.